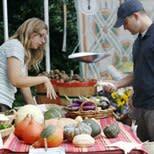 On Saturday, come celebrate treasures that are uniquely ours at the Athens Farmers Market. All sustainable food is grown in Athens soil by local farmers. All crafts are made in our homes by local artists. Live music, merriment, and memories are shared with the young and the old alike on Saturday mornings at Bishop Park! The Farmers Market starts at 8 a.m. and lasts until noon, and there will be live music throughout the morning. Click here for more info and to see what&apos;s for sale this weekend! 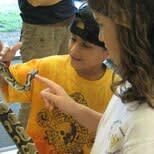 The 32nd Annual Snake Day is this Saturday from noon to 4 p.m.! This popular annual event features a fun-filled afternoon exploring the misunderstood world of snakes! Attendees will have the opportunity to learn about venomous snakes and identification, touch a snake, explore the amazing diversity of snakes and enjoy snake-related crafts and games! Click here for more info! On Sunday at 3 p.m., Dr. Arvin Scott, a multi-award winning percussion artist, will bring his World Beat Nu Jazz to the Athens-Clarke County Library &amp; Heritage Room! This free event is sponsored by the Friends of the Athens-Clarke County Library, and will be held in the Auditorium of the Athens-Clarke County Library! Click here for more info! Athens Little Playhouse Performs "Cafe Murder"